While patrolling the streets of Brooklyn in search of late night festivities I stumbled upon your run-of-the-mill rooftop function, equipped with an on-grade-level DJ, a dance floor in need of resuscitation, and a guest list full of socially awkward New York socialites afraid of losing even one of their 10.4K Instagram followers. But it wasn’t all bad so, with Jack Daniels in hand, I looked to my boys for approval and braved the unknown landscape. Personally, I’m not one to let an evening go to waste, even if the party is on life support, so I made my rounds dancing and weaving my way through the crowd and as the night went on, this random roof top became more and more the place to be. When I finally made my way to the perimeter of the function to catch my breath, someone, who I thought was one of the people I came with, started to walk toward me. 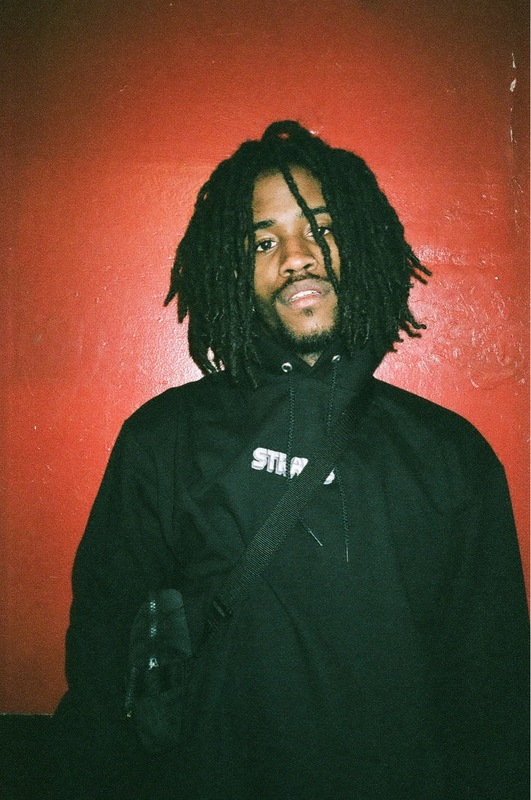 Just as I was about to suggest we make our exit, I realize this wasn’t my friend, rather it was Awful Records’ own KeithCharles fresh from a European tour with singer-songwriter HOMESHAKE. As it turned out, the person I had mistaken him for, Midland Agency’s Aton Ibe, was a mutual friend and this common denominator broke the ice of awkward introductions before it could freeze. Once identities were confirmed, the conversation ran like a faucet. All small talk was cast aside while the subject of creative inspiration took the lead role. The quick run-in swiftly evolved into a near monologue of KeithCharles’ muses, past and present. Whether through drunken passion or pure will to inspire those around him, KeithCharles became a fountain of bohemian energy overflowing with enlightening anecdotes meant to help his creative peers level-up. Thank god the party was calm enough for me to catch every word he said. Everybody can do this s***! Everybody can f****** do this s*** bro. I started making beats on Kazaa. Do you remember Kazaa bro? Limewire Kazaa bruh! My parents are both musicians, I knew from an early, early age what I needed to do this s***. I told my mom when I was like 9 or 10 years old that I needed an MPC. I knew that this is what I wanted to do. And its crazy to me that I’m able to f****** do it. And that’s what this is all bout, inspiration. You’re paying it forward with your talent. I just talk to people all the time and I think that’s helped my fanbase tremendously. After a show, I’d stand out in a crowd and just talk to people and bro, this s*** is actually all about telling someone else that you can do this s***. ..what it takes to do this! Exactly, its almost like older generations or more experienced people tend to put young artists down or tell them they aren’t tight before they even get the chance to develop. Atlanta helped me bro, because I came from the swamps of Tampa, Florida. I’m from the swamps bro, the sticks! Ain’t no culture bro, well except the culture that there is. My mom strictly believes in Jesus. I told her one day, “What if I was muslim?”, she almost got into a car accident. That’s crazy, but thats that old-head mentality. How are you going to deny someone from being themselves. What its all about to me, and I feel like everyone can understand this from my music, is that I’m only here to make sure that people who didn’t know that they could do this, know that they can do this. And can do it better than I can. You feel me? I’ve met crazy, crazy musicians and thats what I aspire to be right now. I’m taking piano lessons, guitar lessons, bass lessons and that has been my dream since I was maybe 14 or 15 years old. You feel me? You have anything specific that you’re working on that’s coming soon? Oh yeah bro, I’ve got different albums under different names. I have a whole house project under the name Small Twin. Is that joint out already? Naw naw, I’m still brewing it, I’m still brewing. I already know Awful Records artists do everything. But one thing I do enjoy about your music is that you are very honest with what you say and even with the sounds you use. Are you a big ABRA fan? She’s way more honest than I am and has been able to get to a certain security that comes from insecurity and thats where I am trying to get with what I am doing now. Before I could get another question out, “Knuck If You Buck” began to blare from the surrounding speakers and like a trap Cinderella, KeithCharles vanished into the dance floor. Although I was not able to relocate him once Diamond’s verse dropped, his glass slipper was the subject of our conversation. Art is, in its essence, meant to inspire all those who it may come in contact with. As KeithCharles says, it is the role of the artist to incite hope in their supporters so that they too can be the one on stage with thousands of followers chanting their lyrics. They too can grow to release award-winning albums and tour the world making millions of dollars doing what they love; all it takes is a mustard seed of inspiration and the openness and willingness to nurture it and let it grow.